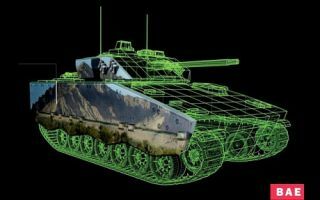 Defence contractor BAE Systems has hatched a plan to cover British Army tanks with an E-Ink surface to make them practically invisible on the battlefield. The high-tech plan which effectively weaponises the tech behind our beloved Kindle reader uses cameras to take pictures of the surroundings and project the images onto the surface of the vehicle. The camera would continually snap images meaning that the tank's surface would be constantly refreshing making it practically untraceable to enemies and freedom haters across the globe. Awesome stuff, huh? The company reckons it will come in handy for British troops fighting in Southern Afghanistan and also want it to be used in future wars. The invisible tank was developed as part of the Future Vehicle programme which is based around 7 different vehicles. Perhaps now we're on the verge of seeing a constantly-refreshable E-Ink shield mimicking the battlezone, is it now too much to ask that we have a colour Amazon Kindle in time for our summer hols?